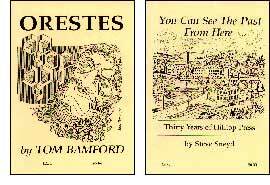 Lost since the mid 1970s and only recently rediscovered, Tom Bamford's long poem Orestes demands reading as much now as it did 20 years ago  indeed in some ways it speaks more urgently to the moods and concerns of the 90s than those of the more blinkeredly optimistic 70s. Presented in an upside-down-and-back-to-back format with You Can See The Past From Here by Steve Sneyd. Though its output over the past three decades has been by Steve's own admission somewhat sporadic, Hilltop's current range of titles is testament to his unequalled status as the ambassador of SF poetry. With contemporaneous records of small press publishing so few and far between, You Can See The Past From Here serves not only as a cautionary tale for new editors, but also as a stimulus for existing small press activists to document their own histories.